2 of my friends who joined me a few times for dinner do not take beef, so I was seeking couple stand-in dishes like pan seared hokkaido scallops (which I didn’t do well previously because I had then no notion yet of the simple logic of a very hot non-stick pan & bone dry scallops), and GR (Gordon Ramsay) crispy salmon which I do rather well. And so I googled and found this videojug’s Duck in Orange Sauce recipe. This recipe is good for making the orange sauce. For better instructions on panfrying the duck, I prefer Gordon Ramsay’s cold pan method to render out the fat & produce a crispy skin. The recipe worked well enough for my first try as you can see in the above picture. However I do not find the breast tender enough and thought that slow braising in the orange sauce or in the oven may work better. Well, slow braising didn’t work well enough, and the slow cooking in the oven also did not work too well until I apply/vary the pan-roasted chicken method on brined duck drumstick, and also adapted/tested out Foodwishes.com chef John’s prime rib method on the brined duck breast. Both these latter 2 methods produced very nice duck drumstick & duck breast, with the prime rib method on brined duck breast producing a very tender, moist & tasty duck breast which can be serve as a standalone tapas OR serve as a main course drizzled with the orange sauce. see here. combine the orange juice, zest, wine & chicken stock in a saucepan. heat & reduce and set aside. lightly season the duck breast with sea salt & coarse black pepper (now I use the brined duck method which have the duck breasts brined in 1 litre water with 5% salt & 3% sugar for 24hrs, so I do not season before putting to the pan). place the duck breasts in a cold pan & turn on the fire & to low. allow the fat to be slowly rendered out and leave for 10mins w/o turning to get a crispy skin(watch Gordon Ramsay’s video on how to do this). turn over the duck, spoon out the duck fat and add 2 tablespoon of soy sauce. turn off the fire. using Foodwishes.com chef John’s prime rib method, I preheat oven to 250degC, then turn over the duck back to skin-down on the oven-proof pan & place it in the oven for 4minutes! leave the duck breast in the oven w/o opening the oven door & turn the timer to 45mins to let the residual heat can slow cook the duck. After 45 minutes remove the duck from the oven, rest & serve standalone as a tapas OR as a main course drizzled with orange sauce. see here. 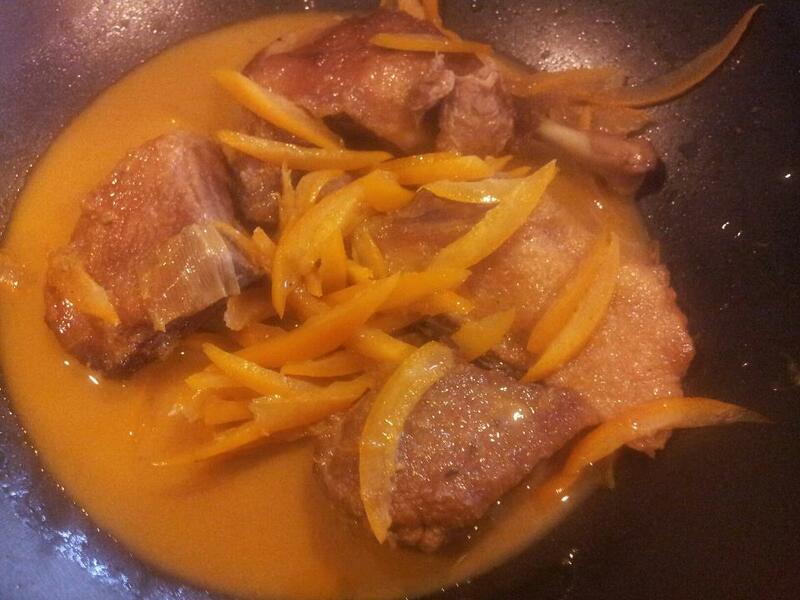 This entry was posted in Recipes and tagged cold pan method, duck, orange sauce. Bookmark the permalink.